Sometimes I have to remind myself that I started this blog for myself, as a way to leave reminders and reflections to look back on in the future. I finished Red Dead Redemption 2 recently, and when I considered taking a break from exam studying to write a blog about it, I thought “but what hasn’t been said about it? Everyone has written and posted a million thoughts on it.” But that’s the line of thinking you practice when you have an audience, and while I am honored and grateful that I do have a few kind souls who check this blog on occasion, I try not to worry about ‘producing,’ because that can stifle my desire to write anything at all. So, like Arthur Morgan and his frequent note-taking and sketches, here are some brief and somewhat random thoughts about my time with RDR2. There will, obviously, be some spoilers. There was some concern about the sim aspects of the game – the weight management, horse care, gun maintenance, etc. – and I have to admit I was a tiny bit worried about it as well. Rockstar used similar systems in Grand Theft Auto: San Andreas and I didn’t like how they (mostly the turf wars) intruded in my open-world exploration and adventuring. The opposite happened with RDR2. Because I started the game during end-of-semester madness and played the rest between intense study sessions, I almost slipped into shallow mission-hopping, just plowing through the game without enjoying the world. But I actually found myself embracing the little things, which quickly turned into a routine, just like the real world. These minute, world-building details gave the game a texture that few other games have. I tried to make it back to camp every night, or every other night, to get at least four hours of sleep. I loved making it back in the evening, before everyone had gone to bed. I would hitch my horse (more on her later), feed her a few carrots and brush her down, then greet a few friends on my way to the stew pot. I’d ladle myself a bowl (no doubt made with the meat I harvested from the wolves that attacked me a couple of days prior), then wander over to one of the few people I actually liked, maybe Tilly or Mary-Beth, and chat with them as I ate. If I needed a beard trim, I’d do that before turning in, and in the morning I’d drink a cup or two of coffee while making small talk with whoever else was loitering around the low fire. Then it was off to work, as I’d feed my horse an oatcake, pat her down, and head back into the wild. When I was out in the world, I was always aware of how dirty I was getting. It was dusty in the desert, muddy in the swamps, and dirty (and sometimes bloody) everywhere else. So I also tried to take a bath every few days, if I could. I wasn’t making a conscious effort to role play. I just felt like I needed to. I felt refreshed coming out of a hot bath, even if I could never quite get my clothes clean. I would forget about my guns more often, but once I bought and customized my two primary weapons, the Schofield revolver and a bolt-action rifle, both black with silver engravings, I kept up with the cleaning and maintenance more often. As with the original RDR, I decided to stick with one horse: the one that came with the special edition. She was a grey war horse, big and powerful, so I named her Freya, after the queen of the Valkyries (at least in God of War lore, heh). I didn’t eat much myself and was perpetually underweight, but I kept a healthy store of hay, radishes, apples, peaches, oatcakes, and more to feed Freya because she was constantly working hard to get me from place to place, and she never threw me once. Plus I ran her into several trees, riders, and over cliffs, so she deserved to be spoiled. Speaking of spoiled, I know I gave a spoiler warning earlier, but just in case someone is reading this and hasn’t played the game, I’m about to spoil something big. So, you know. Just another warning. Ahem. Near the climax, when Freya was gunned down, I actually shed some tears. The game was emotionally intense at points, but I never teared up or cried during other beats. I don’t know if it was an extension of role-playing a hardened gunslinger, and I was definitely moved by some events, but I never broke – except for when Freya went down, and I crawled over to her to say goodbye. That hurt more than Arthur dying, because I knew that one was coming. Somehow I believed my faithful steed would survive that mess. Le sigh. I do think that the epilogue was too long, as others have said. I think overall it’s great, and I love some of the same kinds of world-building minutiae (the house building especially), but it could have been half or a third as long and been just as effective. I do think that the epilogue and the clips that show up in the credits do a wonderful job of bridging the two games, though. I almost wish they’d release a remaster of the first game, because it would be really cool to jump straight from the sequel (prequel?) into the original game. I think having played through the events that prompted the first game’s narrative, many of the lines and scenes would have so much more power. They probably will release a remaster at some point, but if it’s not within the next few months I’ll probably pass on it. I really feel I need the emotions and memories to be fresh in order for it to be effective. Maybe I’d play them back-to-back sometime down the road, though. I see a lot of discussion about self-care now, which is great, so I wanted to write about a self-care tradition I started last year without exactly realizing it. 2017 was a bit of a rough year for me. I won’t go into details, but my girlfriend of seven years and I split, I was diagnosed with anxiety and depression for the first time in my life, and I was increasingly feeling aimless in my pursuit of a doctorate. My birthday, in mid-November, felt especially lonely and like something of a low point. Well, another low point. As a collector of many things – video games, movies, books, toys, etc. – Black Friday is a great opportunity to pick up a lot of stuff that I wouldn’t buy normally because of cost or interest or whatever. I scour ads ahead of time and make lists of limited-time deals to look out for online or which stores are worth hitting up on Thursday or Friday. After all is said and done, I usually have a pretty nice stack of goodies that I won’t have time to watch/play/read for a while. Christmas 2017 was going to be the first time I’d actually spent that day alone in my life. So when the packages from my Black Friday excursion started showing up, I had an idea: why don’t I wrap the things I bought and then open them on Christmas morning? 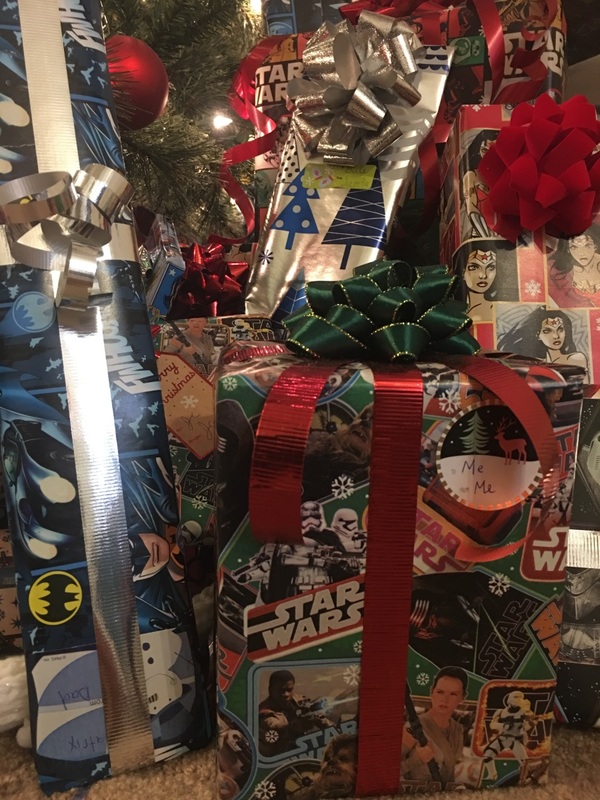 I love wrapping and opening presents, and it would give me something to look forward to, aside from waking up and wondering what other people were doing with their families and friends and loved ones. 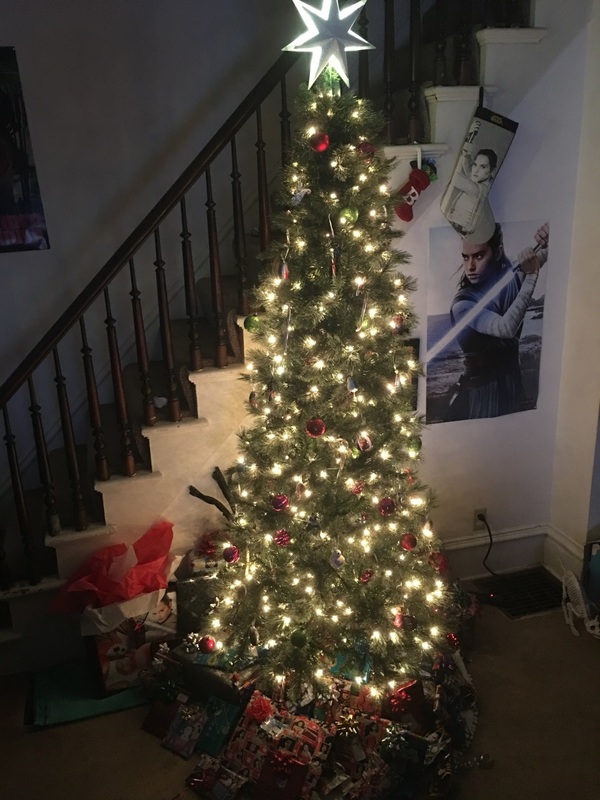 So I put up my skinny apartment tree, wrapped the various movies and games and such, went out and bought some toys and treats for my cat, Bellatrix, wrapped those, and threw it all under the tree. It turned out so much better than I’d expected. I was hoping it would be a distraction, at best, but I found myself giddy when I woke up on Christmas day. I couldn’t remember everything I’d wrapped, so opening the things I bought a month before was so satisfying, and knowing that I had all of this fun stuff to look forward to consuming in the coming months made me feel… hopeful. What made it even more magical was that Bellatrix was totally into it as well. I was expecting her to sit at a distance, watching and wondering what the hell I was doing. But she sat right next to me, sniffed curiously at every gift I opened, and tried to play with her new toys as I unwrapped them. What started out as a practical way to spend a holiday turned into something that made me feel the kind of warm holiday emotions I hadn’t expected to feel again for a very long time. So, this year, I went all out. I started saving new purchases as early as September and hid them as soon as I could so I would at least semi-forget about them. I put my tree up on November 1st. I bought a bunch of new nerdy ornaments. I picked up a ton of deeply discounted movies and games on Black Friday. And, of course, I bought a slew of new toys and treats for Bellatrix. Over the course of three months, I had quite a stack of gifts to wrap, and when I wrapped them I only used my peripheral vision so I wouldn’t actually see the covers. I bought lots of fun new wrapping paper and fancy bows, and stuffed Bella’s little stocking with clearance cat toys. This is a selfish tradition, yes. I don’t feel guilty about it, though. I’m not rich, so it’s not exactly like I ran out and blew a big wad of cash on this stack of presents. I bought them over the course of three months, most of them deeply discounted, and some of them are things I bought to use now and ended up wrapping out of excitement (like a pair of slippers that I need for laundry time on the freezing concrete floor in my basement, which means I’m suffering for an extra few weeks just to have one more present to open). The only thing I really splurged on was wrapping paper and bows, but I’m okay with that. They look so pretty under the tree that it seems worth it. And even if it is selfish, it keeps me excited for what would otherwise be an isolating and depressing time for me. I don’t know how normal this is, or if it would actually benefit anyone, but I wanted to write about it. Thanks for reading. I have a bit of a history of playing Paper Mario games late, going all the way back to the origin of the series, Super Mario RPG: Legend of the Seven Stars. My excuse for that game was a youthful lack of funds, and for the first official game in the series, Paper Mario, it came so late in the N64’s life that I was just waiting for the GameCube to drop (and, well, more youthful lack of funds). I did pick up Paper Mario: The Thousand-Year Door around the time of its release, but it was at a time when I finally had a grown-up job and grown-up money, which meant that I also bought other games. A lot of other games. Games that I didn’t have time to play. Eventually Super Paper Mario released on the Wii and garnered the same kind of high praise that the previous entries had, so I bought that one, too. I still hadn’t played Thousand-Year Door yet, though, so I decided to go back and start my journey with the series there. I like to think of myself as a pretty smart guy. I’m no genius, but I can usually spot patterns and learn from them. But I can be an idiot, too, because of course I deftly avoided playing Paper Mario: Color Splash when it came out. I pre-ordered it. It arrived on release day. I was excited to play it. But I didn’t. I don’t even remember why. I think it was that I’d also gotten the PlayStation VR and a bunch of games and there’s only so much time in a day, right? “Why did I wait so long to play this?” That was my thought a couple of weeks ago when I finally played Color Splash, almost two years after its release. Many people complain about Nintendo “releasing the same game over and over again,” and I think there’s some validity to that gripe, but iteration is also one of Nintendo’s greatest strengths. They are masters at refinement. Color Splash is a little cuter, funnier, and flashier than its predecessors. It has so much visual style in how it presents this beautiful paper world that I kept catching myself admiring the smallest of details. The smallest and cutest of those details is the Holo-Peach, a mini-cardboard Peach that carries messages to Mario. Pictures don’t do the cuteness justice. After it opens up and projects its message, it shuffles toward Mario, arms up, and Mario scoops it up like a little baby. I want one. I’ve heard people complain about the game losing its RPG elements, but I don’t think it’s that dramatic of a shift. You do gain experience, of sorts, in the form of hammer points, which you use to upgrade the amount of paint you can hold, and the only difference that I could tell about the combat is that it doesn’t display damage in the form of numbers. It’s the same turn-based, action/timing-oriented combat that the others used, I think. Would I like another actual RPG set in the Mario universe? Sure. But I don’t hold that against this game, and either way, in the end, I loved it. Will I learn my lesson if/when Nintendo releases the next Paper Mario game in (hopefully) a year or two? Look for my “why did I wait so long to play this” post in three or four years.